Found 6 file extension associations related to Calamus SL and 6 file formats developed specifically for use with Calamus SL. 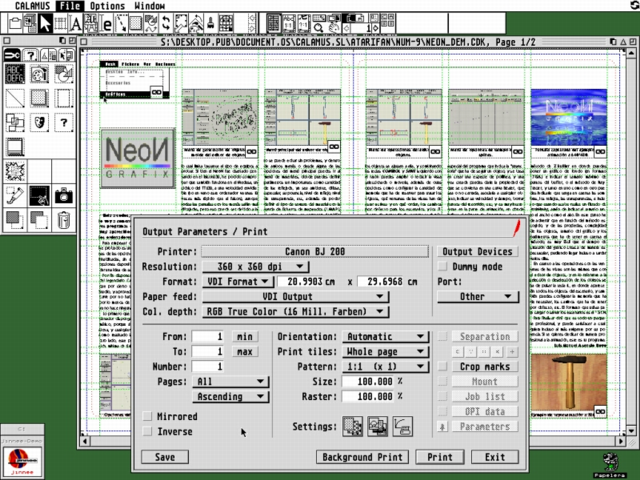 Calamus SL is "not only" a frame based layout system for publishing purposes. Due to its high level of integration Calamus offers powerful tools for text, image and vector editing. Correct your vector graphics directly in your document layout! Change your frame types and edit their contents in different levels (e.g. change text to vector graphic, edit the paths of some letters, then filter a shadow to the graphic and paint in that image frame). Mask any frame in your layout. Use the optional modules to enhance you abilities and possibilites for creative publishing. Create even multicolor blends, barcodes and 3D stereogram pictures in Calamus SL. Use Calipso for editable (!) import of PostScript data from any other application! Beside this fantastic features Calamus offers very flexible micro and macro typographical functions and powerful layout tools. Increase your productivity with the help of the integrated macro recorder, which records almost every available function and lets you define a single keystroke for the recorded work. Use the comfortable text editor EDDIE (light) for text input, typing and typesetting. Even edit all control codes for text rulers, style and kerning information and stuff directly in the text editor. Due to the modular architecture of Calamus SL you are able to increase the functionality with further, optional Module of your choice and needs. It's like Pizza – just take what you want. If you need more information please contact the developers of Calamus SL (invers Software), or check out their product website.